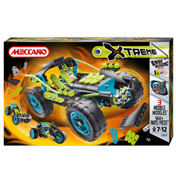 Xtreme from Meccano is an exciting driving adventure suited for children aged 7-12. The range is relatively new, and is designed to bring a faster and easier construction system. The new bits and pieces within these models are suited for the young hands, who often find the metal nuts and bolts in other packs tricky to use. A key new part is the threaded metal bar which has an integrated screw thread, so the bolts screw straight in without the need for those fiddly nuts. 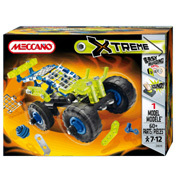 All these new parts are fully compatible with the basic Meccano, which lets you be more creative then ever! 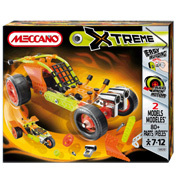 The Xtreme series brings some really funky colours such as the fluorescent orange and green. 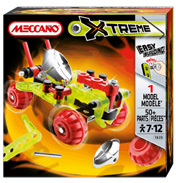 These semi-transparent pieces bring a whole new look to the Meccano toys. The RC 4X4 is the top of the range model. 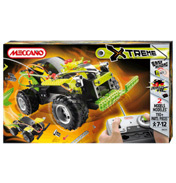 Kids can build their designs around the remote control chassis. Once finished they can take it out for a spin with the RC hand unit.